Mariano Bolizza of Kotor was a public servant of the Republic of Venice. The main objective of his report and description of the Sanjak of Shkodra was to provide information on the land routes which could best be utilized by local couriers conveying official correspondence from Venice to Constantinople and back, and to survey the military potential of the territory. He provides a surprisingly detailed overview of towns and villages in Montenegro and northern Albania in the early seventeenth century, and of the struggle of the Ottoman authorities to put down a rebellion of the fierce and independent-minded Kelmendi tribe. To the most illustrious Lord and most commendable patron, Michele Maffio, from Mariano Bolizza. For various needs of my own and of my friends and patrons, oh most illustrious lord, who have sent me on public service, and in the public interest, I happen to have made numerous voyages, sojourning at the courts of various distinguished Turks and riding through a good part of Albania and all of Montenegro, in short, through all the Duchy and Sanjak of Shkodra. As it seemed inappropriate to me to spend my time in indolence, I spent it in the minute observation of the lives of the inhabitants and of the strengths of those peoples. Since I have become aware recently of how strange and ill considered reports by some careless individuals have caused much anguish to princes worried about their own countries and about unexpected events, I resolved to write a report myself, and this for various reasons. I have written it in particular because, for the last few years, we have been observing hordes of armed Turks gathering every year at the border of my country, Kotor, who, as far as can be discerned from abroad, have been endeavouring to quell Albanian highlanders up in arms against the Grand Turk. As such, in order to clarify the reasons for the gathering of such forces, what they are up to, whom they are composed of and who is leading them, I have delineated in these lines of vibrant and appropriate colour, the principal towns of this duchy and their locations, noting the villages and houses of the inhabitants, and specifying in particular who their commanders are, how many men in arms they are able to assemble, what weapons they dispose of, their rites and customs, and other information of particular interest. I have also added a treatment of the business of official correspondence sent from Venice to the most illustrious and excellent Lord Bailie in Constantinople, transmitted by the inhabitants of Montenegro and then returned from Constantinople to Kotor. I have noted down the routes they use and the stops they make from day to day, as well as how much public money and how much time they spend. I am submitting all this with great respect and dedication to our most illustrious lord, beseeching you to be so kind as to accept it as a token of my faith and service to you and as a small sign of my willingness and readiness to devote myself to you. Not only do I ask you to acquiesce to my boundless and observant desire to serve you as best I am able, but I also beseech God to perpetuate and increase the bliss you enjoy in your country as the beloved father of us all, as an edifying example of integrity in the habits and manner of ruling a land with the many lofty duties you have been charged with, and as an example of noble splendour, gentility and natural amiability, which have rendered you so beloved. In conclusion, I kiss your hand in great modesty, commending myself respectfully to you. Provided here is information on: how many parts this duchy is divided into, how many and which towns it has, together with their locations, how many villages it has in its territory, who in particular are the commanders of these villages, what the rites and conditions of the inhabitants are and what reaches they border on, and how many men in arms can be supplied by them. Provided here, too, is information on the journeys made by the couriers of public dispatches to Constantinople, using the old routes and the new ones. Explanations are given as to how these routes are and how many days' difference there is between these routes, both in winter and in summer. Consideration is also given as to how the State ought to be interested in ensuring that the dispatches are sent by one route or another. Lists are provided with the names of towns visited and stops made by the above mentioned couriers every day on their trips from Kotor to Constantinople. A detailed description is then provided of the harbours, rivers and ports for vessels along the coast from Antivari (Bar) to Vellona (Vlora), the individual names of villages and localities along the coast, of how many feet of water the rivers contain at their mouths, and of the positions of Durazzo (Durrës), Croia (Kruja) and Alessio (Lezha). 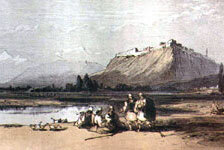 Brief information is also provided about the location and state of the rebellious highlanders who border on Podgorica and who are under the jurisdiction of the Turks who themselves have moved twice with Turkish pashas, generals seconded by the Grand Turk at the heads of huge armies, to put the highlanders down, and what has happened to them and others over the last two years. Finally, a description is provided of the towns of Castelnovo (Hercegnovi) and Risano (Risan) with their villages, which are subject to the Duchy and Sanjak of Hercegovina and are situated at the border, on the coast of the Bay of Kotor. This duchy or, better said, this sanjak can thus be divided into six main parts, which are: Montenegro, Antivari (Bar), Dolcigno (Ulcinj), Scuttari (Shkodra), Podgorizza (Podgorica) and Plava (Plava). Montenegro borders at one end on Kotor, its villages being three miles from that town, on Budua (Budva) at the same distance, on Pastrovichi (Paštrovic), on the Duchy of Hercegovina and on Lake Shkodra, which is separated from Podgorica by the Morazza (Moraca) river. It was formerly ruled by the illustrious lord, Count Giovanni Cernovichio (Crnojevic) who resided in Zabiach (Zabljak), the site of a mighty fortress at the top of a steep, rocky hill and constructed in the modern fashion. 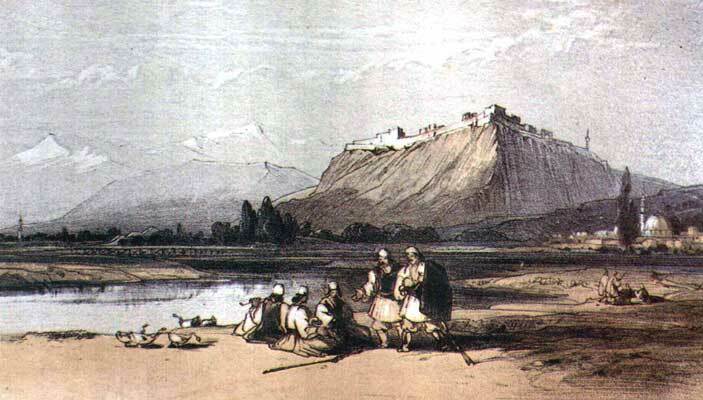 The fortress and the hill are bathed on one side by the Moraca river. On the other three sides they overlook the aforementioned lake. The hill is surrounded by an open town consisting of two hundred fifty houses, the inhabitants of which make their living principally by fishing. They fish for sole and other fish which we will mention at the proper place. Most of the 250 homes are Christians of Serbian rite. In the fortress itself resides only the warden, i.e. the Dizdar Aga, a Turkish official who governs in the name of the Sultan. Inside there are about fifteen homes which are not very big, most of them having been destroyed with the former church of Saint George, which now serves them as a mosque. This first part of Montenegro consists of ninety villages with 3,524 houses which can supply 8,027 men in arms, of whom about 1,000 are arquebus men, the remainder of which use swords, shields and spears. 1. The first region has ten villages and is called Cattuni. 2. The second, commanded by the spahee Vuio (Vujo) in the heart of the mountains, has 32 villages and is called Gliubottin (Ljubotin). 3. The third, Pliesiuzi (Pliesjuci), has four villages, and borders on Hercegovina, as will be mentioned at the proper spot. 4. The fourth region, Zerniza (Cernica), consists of 25 villages, and borders on the lake and Pastrovichio (Paštrovici). 5. The fifth region, Gliescopoglie (Lješkopolje), consists of 19 villages, and borders on Podgorica. 200 houses - the settlements of Gnegussi (Njeguši), Miraz (Mirac) and Zalasi (Calazi), commanded by Count Nico Raizeu (Niko Rajcov), 480 men in arms. Njeguši is situated at the top of a mountain, at the foot of which is a plain surrounded by mountain peaks in the form of a theatre. It has very fertile soil, good for the cultivation of various types of grain. Other fruits and plants cannot survive the cold and the heavy snow which covers the land, sometimes right through the month of May. They harvest wheat and grain in August, mostly though in September. Mirac, which encompasses several houses of Obod (Obot), is a village under the command of count Niko Rajcov of Njeguši. This site was formerly ascribed to the borderland of the territory of Kotor, as can be seen from the privileges granted to that great community by the kings of Serbia. Now in the hands of the Turks, it is situated in the highlands, a mere three miles from Kotor. Its inhabitants were involved in a long standing dispute about pasture lands and property with the people of the village of Spigliari (Spiljari), which is below Kotor and situated to the side of the castle. The people of Obot extended their border right up to the gates of the village of Spiljari, so to speak, one arquebus shot away from the castle, and had this confirmed by the decree of one Feris Bey who, commissioned by the Porte of Constantinople, set the boundary stones and borders for all of Dalmatia and Kotor. Thus, the most illustrious lord, Francesco Bragadin, who was rector and proveditor of Kotor, a person of great worth and merit, commissioned me, Mariano Bolizza, the aforementioned author of these lines, to carry out negotiations in this affair of importance. The latter presented his case to the various beys of the sanjak and duchy of Shkodra, to the Kadis of Montenegro, Podgorica, Shkodra and Pech (Pec / Peja), who issued warrants in accordance with his wishes. As such, he concluded the business successfully, taking it even to Constantinople. The borders of the area called Obot were extended to over two miles in width and eight miles in length. This is all confirmed by decrees sent from Constantinople and by a number of clearly formulated patents. The 70 houses of Zetigne (Cetinje), commanded by Count Batrich Vulatcou (Batric Vulacov), can supply 170 men in arms. Cetinje is situated on a plain four miles long and two miles wide, which is not very fertile. Here, near the site of four huge and skilfully constructed wells of fresh flowing water, the most illustrious lord, Count Giovanni Cernovichio (Ivan Crnojevic) built a small but very attractive monastery for the monks of Saint Basil's of Serbian rite, in which there resides an archbishop with 25 monks and 40 other clerics and servants. This prelate, being the metropolitan, has spiritual authority over all the inhabitants of Montenegro and recognises as his superior only the very reverend Patriarch of Pec. commanded by Vuco Raiceu (Vuko Rajcev). commanded by Rado Stiepou (Stjepov). commanded by Vuco Mixou (Vuko Miksov). Note that from the first two parts of Montenegro come the men who serve as couriers of the official correspondence which arrives from Venice by ordinary frigates en route to Kotor. It is sent on to Constantinople by the most illustrious rector, at the behest of the most excellent Senate, and is then returned from Constantinople to Kotor, from where it is sent on to Venice aboard the aforementioned frigates. These persons may be one hundred fifty in number, and are used more or less according to need. Most of them are based continually in Constantinople, receiving their salaries there. From time to time, they are sent from there in line with their pay, means and conditions, which will be explained below at the proper place. Let it be said in addition that the principal mountain above the city of Kotor, which was formerly its border in line with the aforementioned privileges, is known as Louchen (Lovcen), called Monte Sello (Saddle Mountain) in Italian. It is a mountain of soaring height such that from its peak, when the weather is good, one can see master Augusta and the Augustines in the water to the west, and Durrës and Shkodra to the east. This mountain verily abounds in sources of clear and fresh flowing water which, running through secret channels, still provide the city of Kotor with an abundance of water. Here, in an area extending twelve miles along the ridge of the mountain, there is extremely rich pastureland. As such, the fat and humble sheep find abundant restoration when the summer heat becomes unbearable. Once they have grazed and quenched their thirst, they can rest from the midday heat in the shadow of the innumerable lofty beeches, ash and pine trees which provide shade all day long. In the summer, beginning with the month of May, all the people of Montenegro take their numerous herds here and build little huts covered in straw of rye, supported by beams intertwined with wicker. There, they take great joy and pleasure in the income which the prudent shepherd derives from his flocks. Then, in October, they lead their flocks back down to the coast where they remain until April, taking refuge and protected from the cold. The mountain is replete with innumerable fertile valleys, in which the beech trees, serving as a decor, provide the flocks with rich sustenance from their foliage. The very soft ground here produces grain in abundance, such as barley, rye and oats. They reap rich and abundant amounts of hay. The mountain also abounds in various species of wild beasts, such as bears, wild boars, wolves, lynx, foxes, etc. It is also very abundant in a great variety of medicinal herbs of great value. This can be shown by the fact that a good number of valiant herbalists both from Italy and from other countries of the world have often come to Kotor to collect them. Zuze, a village enumerated among those in the first part of Montenegro and also called Cattuni (Katun), situated at one good day's journey from Kotor, produces soft pitch called catram (1), which is shipped by merchants for the most part to Venice. Kotor is furnished from Montenegro with copious amounts of wheat and other grains, cheese and meat. The above mentioned catram is also produced in great abundance in the villages above Risan. The twenty one villages in the fourth part, which is Gliescopoglie (Lješkopolje), are situated on a very pleasant and fertile plain which is irrigated by three rivers abounding in fish. One of these rivers is the above mentioned Moraca, which separates the plain of Lješkopolje and Montenegro from Podgorica. The second main part of this duchy is Antivari (Bar) and its territory. We shall thus provide a description of the villages which are situated in the territory of this town, beginning at the border of Paštrovici. the fair city of Antivari (Bar), which fell in the year 1572 and was taken over by the Turk. It is situated at one end of a very pleasant and very fertile plain and overlooks this countryside from the top of the steep hill it is situated upon. Inside, there are some 400 houses. In the open town surrounding it, where the main Turks live with their gardens and parks, there are about one hundred houses. The Mrkojevici, like the Paštrovici, were privileged by the Most Serene Republic of Venice and still receive salaries. The territory of Bar is the site of the ancient convent and monastery of Santa Maria di Rotazzo, an abbey constructed by Queen Helena and her son Stephan Uroš, Emperor of Serbia. The income from the monastery derives mostly from a place called Lugh (Lug) in the territory of the Paštrovici, subjects of most serene rule of Venice, and from a number of other places situated in Paštrovici which are also subject to this rule. All of this plain, which is six miles long and three miles wide and in which there are other villages, is subject to that church and is included in its endowment. One third, one fifth and one tenth of the income is to be rendered to the church, but has now fallen under the Paštrovici monks of Serbian rite, against the wishes of the abbot and rector of that church, who is a Catholic prelate delegated by the Holy Apostolic See. The city of Dolcigno (Ulcinj) is situated in an exceptionally fair spot on the coast, with a very fertile and productive territory abounding in olives and other fruit bearing trees. This city was lost in the last war of 1573 and fell into the hands of the Turks. It continually maintains 300 ulufehâr, who are salaried soldiers. There are some 300 houses in the open town and 800 men in arms. These Turks have turned into pirates and with their small galleys often cause great suffering to sea vessels, which they attack while the latter are on their way to Albania to load grain or while they are returning full of grain to Budva and Kotor. We shall now continue with the villages from the bridge of Shkodra on the mountainside along the lake up to Zarniza (Carnica), twenty two villages all of Roman rite, as have been all the villages we have described up to now beginning at the border of Paštrovici in the territory of Bar, with the exception of Markojevic, which is partially Orthodox. On the bank of the Buna river towards Shkodra, beginning in Zadrima across the plain. The town of Driuasto (Drisht) is situated on a mountainside, surrounded by steep mountains, and rises with a castle on the peaks overlooking the town, like the castle of Kotor, and with an open town around it. It is a strong site but not very populated, although there are inhabited homes in the open town across from the field below, which is cultivated and very fertile. It is situated twelve miles from Shkodra. Nearby there are are two small villages. This was one of the foremost cities of Albania in which a proveditor-general of the Most Serene Signoria of Venice resided, to whom the court sentences of Kotor went for appeal. because it is the permanent seat of the sanjak bey. The fair and mighty fortress of Shkodra, is situated on a hill at the end of the lake and of the Buna River. The settlement, including the open town, has some 400 houses and 1,000 men in arms. The Buna River is extremely fertile and abundant in all kinds of fish, and every season produces its own fish. In the river, various types of water mills have been constructed. The river itself is swift. It is crossed by a very long and quite high bridge made of wood which constitutes the passageway between the two banks of the open town. The lake, called Lake Shkodra, ends here and empties into the said river, where several fishing weirs have been built. The Buna flows into the sea. From its mouth to the town is a distance of 24 miles, i.e. 18 miles from Shirq, where there is a church situated on the riverbank, an ancient and magnificent building which was constructed by Queen Helena and dedicated to the honour of Saints Sergius and Bacchus. From the church to the town is a distance of six miles. At the mouth of the river there are six, seven or sometimes eight full feet of water. On the very fertile and fair plain, abounding in delights, there are twelve beautiful villages. Seven of these, on the side leading to Podgorica and bordering on the mountainsides which are in open rebellion against the Sultan, are within its jurisdiction. In the Buna River, in the fish weirs situated along the bridge and the lake near the town, various types of fish are caught and, as mentioned above, each season has its own fish. In April for instance, shad and gavoni can be caught in abundance. The precious and delicate shad weigh four to five pounds each. In May there are huge leer fish and meagre, in June there are all sorts of large frogs, in July there are all sorts of pascere, brill and spogli, in August large mullet and large roe, in September there are medium sized mullet and eels, in October there are all sorts of eels, in November there are grey mullet, in December there are Jew fish, and varoli, in January there are sea bream, in February there are bleak and eels, and in March there are flounder, brill, eels and all sorts of frogs. The lake mentioned above in the description of Montenegro and Zabljak, begins at the town of Zabljak itself, at which point two very swift rivers flow into it: the Moraca, which is itself made bigger by other rivers which will be referred to below, and the river which has taken the name of the illustrious lord, Juanne Cernouicchio (Ivan Crnojevic), i.e. because he built houses and mills along the banks of that river. This lake is a delight both in summer and winter because of its site and the fishing, and it is navigable, too. It is sometimes buffeted by strong gusts of wind. Boats and frigates ply the lake with sails such as those stolen by the pirates of Ulcinj from the people of Perast and Kotor in Albania. It has a circumference of 120 miles. In it there are some five rock faces, each of which was named by the monastery of the Serbian monks who live there. The most important ones are S. Nicolò di Vuranina (St Nicholas of Vranina), Com (Kom), Bescagoriza (Beskagorica), Starceuagoriza (Starcevagorica) and Moracnich (Morasnik). It abounds in all the kinds of fish that breed in fresh water, at Shkodra and its fish weirs, too. The lake is especially rich in trees, many high poplars, willows and other such trees which thrive on the water. Here in the winter, beginning in October, come countless birds called cormorants, commonly known in Turkish by the name of carabulach (2), all kinds of them, such that if you had not seen the quantities of them here with your own eyes, you would find it difficult to believe, and even more difficult if you only read about them. What is most noteworthy is that these birds serve as the principal means of fishing for bleak, which is carried out in the following manner. In the lake, near the mountain called Bazagur (Bazagur) there is a naturally formed theatre of water surrounded by lofty trees. Its total surface could measure one square mile. There, at the base of the mountain in this quite substantial body of water which has a depth of some three to four paces, there are a number of wicker constructions in the form of great fishing baskets, each of which being as large as a vat equivalent to ten Venetian barrels. These baskets are attached to long perches which are anchored to the bottom. The wicker baskets in the form of chambers are maintained and repaired, so to speak, in the summertime when the water is low, by being weighed down to the bottom near the base of the perches they are attached to. When lined up in the water, they extend to a length of half a mile. Each of the owners has his place and his own fish weir. Indeed, some run two, three, five or even ten baskets, if they are able to. The sites, which are commonly called 'boats' and can contain three to four baskets, are sometimes leased out for up to forty or fifty talers a year. The bleak, which come here in the winter to escape the cold and muddy lake, take refuge and enjoy their rest in the warm waters, as there are spring waters there. The baskets and the fishing sites are guarded by watchmen so that the birds do not get into them at the wrong time. Little barques, being small skiffs made of oak trunks carved out in one piece, set off from Zabljak. Gathering at this spot called Bazagur, there are sometimes four to five hundred of them from various parts of the lake. They also come from the town, accompanied by many interested people including a good number of Turks. A hodja, that is to say a Muslim priest, stands in a barque in the midst of the water, and, after saying a prayer in Turkish, he claps his hands, when he deems the moment to be propitious. He then lets out a cry or call, giving the birds a signal. Indeed, they seem to be waiting for him and understand him from high up in the trees. All of a sudden, they swoop down to the fishing spot. Plunging into the water and swimming about with great pleasure, they feed on the fish which, exhausted and frightened by them, can find no other escape or refuge than to dart down and hide in the baskets. The Turks standing over the baskets catch them alive with their bare hands for fun and then let them go again. Once they see that the birds have had their feed, they shout at them. The birds take flight with such noise and commotion and with such a fluttering of wings that whoever happens to be standing nearby is dumbfounded and gets soaked in the process, too. The birds then settle on the water a bit farther away. Now I will tell you something amazing (and yet I swear that it is true). Whoever shoots with a long arquebus, like those used for hunting in the lagoon of Venice, will strike as many birds as he has shots. What is more, since the birds cannot take flight swiftly after such a feeding, they can readily be caught alive by those in the barques, whom I mentioned earlier. The birds, as if tame, wait for the barques to approach. And as for those which can still fly and reach the tops of the trees, I have on several occasions killed ten birds with one shot, while the rest of the birds sit motionless in the tree. It must also be noted that, when in flight, they stay so close to one another that they look like a thick black cloud darkening the vaults of the sky. In fact, the birds are under protection and may not be hunted, in particular at this theatre spot. There is a fine of 300 aspers, equivalent to four ducats, for each bird slain, plus confiscation of arms. This is for good reason. If it were not for the birds, there would be no bleak fishing. For this reason, the inhabitants of Zabljak hold the birds in great esteem and judge the coming fishing season by the number of birds. The owners of the baskets open them to see the fruits of the birds' work and often find the baskets full so that they can load their boats to the hilt with fish and, for this reason, use much bigger vessels than the barques. Once they empty the baskets, they return and put them back, carrying on in the same aforementioned manner for several days in a row with the baskets full of fish on some days and empty on others. A great multitude of people from all classes come and gather at this spot and all of them receive generous gifts of fish from the owners of the baskets. Among the fish, they sometimes also catch tench weighing five to six pounds and, similarly, wonderful and very delicious eels. This site abounds in all types of birds imaginable: endless numbers of ducks, fieldfare thrushes, cranes, geese, gulls, storks, pheasants and others, as well as all sorts of birds of prey, such as superb goshawks which the Turks catch in their nets and which emerge miraculously unharmed. One can see the Turks out hunting in boats with their goshawks very early in the morning. They remove the bell from the bird and then set it down on the boat. They themselves remain seated and, when they see other birds, they give a call to the goshawk which takes flight and hunts them down. At the end of the day, the hunters return home having caught twenty to thirty ducks. The river Moraca, which bathes the town of Zabljak on one side, is an extremely swift flowing river. At the end of February and in March, you can sometimes see five to six barques on it, each with one person on board holding a fishing rod in one hand with a horsetail line and a hook baited with a bit of fresh bleak. Depending on how the water is flowing, these boats, with the help of an oar, make their way out into the middle of the stream, even into the swiftest part of the current. The boatman sits in the middle of the boat, leaning on a pole which he holds with his left hand, thus steering the boat against the current. The trout come upstream from the lake, where they spend the winter, to reach another lake in Pliesiuzi (Plijezivci), swimming a distance of one hundred miles up the river. They can be caught here with bleak bait, the line and a thin rod, which, to the amazement of all onlookers, can hold a weight of fifty to sixty pounds. The fifth main part of the duchy of Shkodra, which is the most delightful and beautiful part, is said to be and, in fact, is Podgorica, a small fortress surrounded by a large open town of 900 houses, Christian for the most part. It is a fortified town, an open town and a village all at the same time. This town is situated on one side of the aforementioned Moraca river, which on the right bank, in the direction of Shkodra, divides it from Montenegro and on the left bank divides it from a range of inaccessible mountains, home of the highland rebels, whom we shall refer to below. These mountains stretch sixty miles down to Shkodra. Since when I referred to Plijesivci above, I promised to mention the fish which can be caught in the lake there, I must now keep my promise and say where and from what body of water this lake derives its origin in order to explain how many rivers flow into and enlarge the Moraca. Above Pliesiuzi, the river Povia takes its source in a very rugged mountain region and flows downwards to Pliesiuzi on the plain, forming a small lake, which constitutes the start of a great river in which huge carp and trout are caught, sometimes weighing up to one hundred pounds, as well as choice eels. It is here that the trout rest on their way from Lake Shkodra up the Moraca. This river continues for a distance of twenty-five miles and joins the Moraca river below Momisichi (Momišici) across from Podgorica. The Moraca is also fed by the Ribnizza (Ribnica) river which takes its source above the village of Scatizza (Skatica) and flows into it below the town of Podgorica. The inhabitants of the area fish in the Ribnica river and catch small trout of ten to twelve pounds each, as well as chub and beautiful tench. The Zieuna (Cijevna / Cem), another river, which shall be referred to below, takes its source in the Chuzzi (Kuç) mountains, where it forms a little lake which becomes a big river, sixty paces wide. It flows from here for fifteen miles and joins the Moraca below Gargli (Garljin). In this river they catch small trout and tench. The Sitniza (Sitnica) river takes its source in Beri, a Montenegrin village in Lješkopolje and flows across that plain for a distance of five miles where it, too, joins the Moraca. In this river they catch chub and tench in great abundance, as well as bleak. The above mentioned river Moraca takes its source in the mountains of Moraca, a village of Hercegovina. It flows for a distance of 120 miles and below Zabljak flows into Lake Shkodra, enlarged by five rivers, including the one named after the most illustrious lord, Count Ivan Crnojevic. In this Moraca river, they catch large trout, frogs, chub and bleak. At the point below Momišici where the rivers flow together, or, better said, where the Moraca takes the Povia with it, a Turkish dignitary from Podgorica had a large fish weir built, one of great utility and productivity so that in the long baskets positioned in the shallow water, trout from the lake could be caught; indeed they catch great numbers of them and various kinds measuring up to seven palm widths. The mountains on the one side and the river on the other form the borders of a very pleasant and beautiful plain which begins at the fortress and town and extends sixty miles with a maximum width of thirty miles between the mountains and the Moraca. At the head of the plain there are seventeen fair and fertile villages, inhabited for the most part by important Turkish dignitaries who, in order to ensure a livelihood, have built splendid buildings and stables for horses. They live there for pleasure most of the year. This plain is bathed by two rivers: the Moraca and the very swift Cijevna with its crystal clear water which flows under a long bridge built of large and long beams of oak. The open town and the fortress could furnish some 2,200 men in arms. They make good warriors and, as was noted above, are Christians for the most part. Among them, there are some 250 excellent arquebus men with long arquebuses like those of the Algerians with one-ounce bullets. The rest are cavalrymen with lances and javelins. The Christians use swords, shields and spears. When the Sanjak Bey is away from his normal place of residence in Shkodra, he resides most of the time in Podgorica in order to find good pasture land for his horses, as well as enough grain and other necessities to feed himself and his people. He usually takes with him one hundred lancers as well as one hundred fifty and occasionally two hundred arquebus men, who are called sermeni (3) in Turkish, equipped with short-barrelled Turkish arquebuses. This place is most suited to deal with his affairs because near at hand, a mere fifteen miles from Podgorica, are highlanders who border on those of Montenegro, whereas the latter are half a mile away. As such, he can negotiate an accord here either with the highlanders who, as rebels, show no obedience to him, and or with those of Montenegro for the ordinary services he can expect from them. Everything goes easily and, aside from this, he is attracted all the more by the beauty of the countryside when he arrives to reside there in the spring and remains throughout the summer. Podgorica has several ulufehârs, spahees, çaushis of the sultan, müteferrika and alay beys who are registered in tefters or scrolls of the sultan in Constantinople and who take part in expeditions according to government decrees, i.e. credentials substantiated by a mühür or seal with letters, which is called the Sultan's Seal. The ulufehârs receive salaries, whereas the spahee horsemen are in service and are obliged to go to war whenever the sultan commands them to do so, taking with them as many men as the timar orders, or their money and as many lances as can be financed from this money. The same applies to the müteferrika. The alay beys are the sergeant majors of the duchy or sanjak in particular in the field. All these paid officials are divided among the villages of the highlanders, who recognize the spahees and others as their rulers and who give them a certain portion of their income each year, just as the concierges and courtiers of the most illustrious lord, Nasuf Pasha, in Constantinople are rulers over the Kelmendi. Bielopaulichi (Bjelopavlic) is under the command of the army of Podgorica. Cuzzi (Kuç) and Bratonosich (Bratonosic) and part of Plava are under the soldiers of Medun (Medun), because most of the other part of Plava is under the command of Sem Zaus (Cem Çaushi) of Podgorica. Hoti is commanded by Lord Zaffer Zaus (Xhafer Çaushi) and Rezepcceleppi Hazichi (Rexhep Çelebi Haseqiu). Vassoevichi (Vasojevic) is under the command of Ahmat Celeppi Hadrovich (Ahmet Çelebi Hadrovic) and Jesuf beg Karzmich (Jusuf Bey Karzmic). Piperi (Piper) is commanded by Lord Mehmet Aggà Glauatouich (Mehmet Aga Glavatovic) who is the müteferrika. Slatizza (Slatica) is under Lord Bego Sinanbegiouich (Bey Sinan Begovic). Rapsa (Rapsha) is under the command of spahee, Hazo Momcelouich (Hadzo Momcelovic). Scarglia (Shkreli) and Castratti (Kastrati) are commanded by Lord Hazaggà Hadrouich (Haxhi Aga Hadrovic). These highlanders have acquired the name of rebels because for the last few years they have not been allowing any of the above mentioned officials to enter their territory to collect the usual taxes. Neither do they permit entry to the voyvodes, who are the executors of justice or, better said, the judges, who punish people for infractions of Turkish law. Those who commit major infractions are sentenced to a fine which, for the most part, they pay to the voyvode who leases the voyvodeship from the sanjak bey for three-month periods and who thus represents him in the territory in question. We continue here with the villages. Gruda and Tuz with a total of seventeen villages are of Roman rite as are the villages along the base of the Verzi (Kuç?) mountain. These seventeen villages of the plain of Podgorica have already been mentioned, but it must be added that at the edge of this plain towards Curillo, Plavnizza and other villages which extend along the banks of Lake Shkodra beginning at Zabljak, there are very dense and leafy forests. This is the home of infinite numbers of wild animals, such as huge bears, hogs, wild boars, deer, stags, roe deer, wolves, lynx, wild cats and others which provide an opportunity for the Turkish spahee gentlemen to gather on the occasion of great hunts which they organize on that plain and during which the manliness of their subjects is tested. The latter are often to be seen putting their lives at stake in order to confront bears, which they attack with swords and spears, or extremely ferocious and cruel boars which, once wounded, go on a rampage through the countryside, terrifying onlookers. They lay in wait for such animals, wound them and then slay them. But aside from these individuals who show off their bravery, most of the common people go out on horseback, bearing spears like pikes with metal ends and ordinary lances and, spurring their swift and valorous horses into a full gallop, they wound and slay the beasts with infinite pleasure and delight. Above Slatica on a hill at the foot of the mountain which marks the end of a beautiful plain, is the ancient town of Dioclea, built by Diocletian. Once a Roman colony, it now lies in ruins, and from what remains, it must have had a circumference of six miles. To be seen are the foundations of various palaces and the outline of a cathedral. One can find various blocks of beautiful marble and a great many columns of hard stone embedded in the earth. If you chisel away at them a bit with a hammer, they reveal even more colour. On many a slab one can read the name of Paulus Aemilius chiselled out in Latin letters. There was no flowing water so they brought it underground across the fields from the Cijevna river at a distance of twelve miles or more. In addition, one can find all sorts of gold, silver and metal coins there. The Turks of Podgorica make use of the well carved stones and the above mentioned marble for their buildings and have them brought in from there on wagons. I shall continue by describing the peoples who are up at arms against the Turks and who live in a mountain range in well, though naturally fortified sites. This mountain range begins at the border of the Duchy of Hercegovina and extends down to Shkodra to Chuseu Lug (Husev Lug) as has been said. It consists of a total of eleven villages. Five of these are of Serbian rite and six of Roman rite. At the start of the mountain of Kuç above Gruda in a cleft in the mountainside between two other mountains is a beautiful hill overlooking a very spacious valley. It is there that the little town of Medun (Medun) was built, a very strongly positioned but badly guarded site which is virtually in ruins. It is inhabited inside by the Turks commanded by a warden, i.e. the Dizdar Aga, and some two hundred very warlike people. Here, before the sultan took over Podgorica, Albania, Montenegro and these lands, at the time when the most illustrious lord, Count Ivan Crnojevic, was residing and ruling in Zabljak, a number of Turks commanded by their leader, a certain Mrahor Aggà (Imrahor Aga), took refuge in this area and often did battle with Crnojevic forces, attempting to expel them from Medun. Men from all parts hastened to assist the Turks and, although Imrahor and many of their other leaders were slain in the bloody battle between the two sides, the Turks remained in control of the town. From this point on, began the downfall of Crnojevic and the loss of his state. I still possess the blade of Imrahor Aga's beautiful scimitar which he got from Crnojevic in that battle and which was subsequently given to his relatives, nobles of Kotor. In Pec, which is a four days' journey from Kotor, is situated the seat of the patriarch of the monks of Greek Serbian rite, where Patriarch John resides in great pomp, guarded and protected by Turkish janissaries obtained from the Porte in Constantinople and paid and lodged by him in his splendid palace. There, too, there is a very wealthy and fair church in which the bodies of diverse Greek saints are held in great veneration and in which the holy body of King Milutin of Serbia is kept, revered for the many miracles it has performed. For this reason they called him the sveti kralj (holy king). This patriarch reigns in spiritual affairs, though only for those who are of Serbian rite, over all of Serbia, Podgorica, Montenegro and Zuppa (Zupa) which was part and parcel of Kotor, as will be mentioned below. Situated on a very broad plain full of large villages and bathed by many rivers which, though not large, are abundant in fish, is an extremely pleasant and fertile place called Plava, once inhabited by a large number of wealthy people, but which is now destroyed for the most part by the marauding and pillaging Kelmendi highlanders who live nearby. Each day, they used to export up to two hundred horses laden with wool to Kotor, which is only three days away, as well as other types of goods such as wax, cheese and wheat. Now the original inhabitants, at the order of the Sultan, are returning from various regions of Turkey to live there once again, in particular, as will be noted below, since a fortress has recently been built at the border of Kelmendi which serves to stem the plundering and to ensure peace and quiet for the inhabitants of Plava. Thus, as was mentioned above, three hours from Gucinje and an equal number of hours from Kelmendi, the sultan constructed a fort called Città Nova (New Town) at the end of 1612 on a little hill in a well fortified position. It is as big as a field with a circumference of 400 paces, built of huge beams nailed together and filled with earth, and surrounded by wide moats which are filled with water and spanned by three drawbridges. The fort is guarded from within by two hundred foot soldiers and fifty cavalrymen. The fortification was constructed at the insistence of Sem Zaus (Cem Çaushi), the main Turkish leader in Podgorica. Since he was ruler of Plava and was unable to enjoy his rule there both because of the destruction wrought by the Kelmendi and because he could not get there safely, he sent word to the sultan in Constantinople by means of the most illustrious lord, Nasuf Pasha, whose concierges and courtiers are interested in ruling over Kelmendi, for a fortress to be constructed in order to repress the furor of the rebels and keep them in check and in submission. And his request was granted. But those who guard it are still unable to prevent the Kelmendi from marauding and pillaging anywhere they want. Mention was made above of the highland rebels in general. It is now time to go into detail to describe their land, their customs, their battles and things of importance which have occurred among them in 1612 and 1613. Aside from the fact, as was mentioned above, that these people (who amount to over five thousand three hundred eighty men in arms) are strong because of the nature of their territory, living in such mighty and inaccessible mountains, the main factor of their strength is nonetheless their unity. This unity has been seen ever since the time they resolved at an assembly they held among themselves not to pay the usual tribute to the sultan and, what is more, not to give the individual spahees the duties owed to them, as was said above. This happened because the Turks had oppressed them heavily. They thus swore an oath, as they are wont to do, not to abandon one another but rather to remain united, to help those in need and never to allow the Turks to enter their territory. Having, in this manner, attained a more favourable situation by overthrowing Turkish tyranny and not having been worn down by indolence, they turned to robbery, travelling in hordes through the Turkish countryside right to Plovdiv and plundering towns, villages and trading caravans, and have become so rich, that each of their 188 houses throughout Kelmendi owns twice as many furnishings as usual, including gold and silver equipment for at least one horse: i.e. scimitars, harnesses, collars, and some even have fine saddles with silver and jewelled armour, such a load being worth 150 to 200 gold zecchini. They also have expensive horses, exquisite garments of great value, gold and silver cups and bowls and an endless numbers of animals, small and large. They go armed mostly with swords, shields and spears, and with an endless number of slingshots which they use masterfully. They rarely have arquebuses although all those who do have them, in order to be properly equipped, carry very good gunpowder with them. There are no more than one hundred arquebus men among all the highlanders. These individuals are so agile, expert, courageous and ready for battle and they line up so well for battle that whoever sees them, can do nothing but marvel. They can be seen in armed ranks, in skirmishes, doing battle, attacking and withdrawing, cleaning up and making their escape, such that they actually look very well-trained and versed. Military veterans parade with them on all holidays, and especially on major feast days. Most of them go barefoot so that when they are walking along cliffs, they resemble mountain goats. The court in Constantinople has been and is continuously bombarded with complaints about robbery, vandalism and uprisings on the part of these highlanders so that in 1612 the sultan finally resolved to send an expedition against them, led by a pasha, the son of the Mehmet Pasha who was murdered at the Divan, that is to say, at an audience. The new pasha was invested with the pashalik of Bosnia and resides in Banja Luka. He was also granted the Sanjak of Hercegovina as an arpaluc (4), which in Turkish means for his horses. He arrived in Podgorica and gathered from various regions a force of some 25,000 fighters. From there, he sent his Aga and confidant to Kotor, accompanied by many important Turks from Podgorica and with letters of credit directed to the most illustrious rector. He also wrote separately to Bolizza, the authors of these lines, to deliver them to their proper destination. Ruler at that time was the most illustrious lord, Gieronimo da Mollina who, as a noted gentleman well-disposed to public affairs, had informed the most serene Senate in Venice of what was taking place even before the pasha arrived. The Senate had rewarded this person with quite a valuable present for his troubles. Now, having read the letters and having seen that they were from the pasha's steward, who after other particularities and compliments requested in the name of his master the usual tribute, he replied that the tribute which was due to the Sanjak Bey of the Duchy of Hercegovina was ready but, although seeing that the letter had been written by the pasha's steward, he was not certain who the Sanjak Bey in question was. He asked the pasha to contact him once more using a mühür or a seal bearing the head of the pasha, asserting that he would then be satisfied. All this took place and was accomplished with the intervention of the aforementioned Bolizza. The letter came back, as requested, with the seal, the Turks were authorized to accept the normal present due to the Sanjak Bey of Hercegovina and, in exchange, a beautiful horse was sent to the most illustrious rector. In the meantime, the pasha with the aforementioned army, having endeavoured on several occasions to attack the rebels, ended up by spending three months in Podgorica, realizing that he would not be able to act or to cause any harm to the rebels. He treacherously set fire to the village of Biellopaulichi (Bjelopavlici) and enslaved some eighty souls, i.e. the women and children, and seized a small number of farm animals. The men of the village had escaped with the rest of the animals and had taken refuge in other villages. The pasha thus resolved to depart and, when they broke camp and were setting out, over 300 Turkish spahees were cut to pieces by the highlanders. Their horses and baggage were also taken. The war ended thus without any other battle of significance. In 1613, Constantinople sent Arsolan (Arslan) Pasha against the highland rebels, together with seven sanjak beys, i.e. those of Prizren, Pec, Dukagjin, Chazagnich (Kaçanik), Elbasan, Zadrima and Shkodra. They brought with them the usual forces of the sanjaks and gathered together an army from various regions, adding forces from Montenegro. In all, fifteen thousand soldiers were assembled. It was alleged indeed that there were over sixty thousand. This army remained inactive for twenty four days, with nothing to do, until the pasha rose from Podgorica, taking his spahees and several local infantrymen with him, and set off for Kelmendi. There they remained for twelve days doing nothing but enslaving Kelmendi families whose members, as they had learnt from their spies, were hiding in other villages, these being eighty souls with women and children. The other village of Kelmendi agreed to give him fifteen slaves and one thousand ducats. While the pasha was waiting for the agreement to take effect, he sent one hundred horses to Podgorica for them to recuperate. The warriors of Kelmendi, however, ambushed them on a narrow path, massacring thirty Turks and seizing fifty of their horses. The pasha was horrified by this and, weeping and suspecting even worse, left Kelmendi without accomplishing anything and returned to Podgorica. He immediately called for assistance from Città Nova (New Town) and set off with them and his whole army to plunder Vassoevichio (Vasojevic), a village of eighty-five houses, as mentioned above. There they did nothing of particular interest except capture about sixty souls, boys and womenfolk, who had fled to nearby villages to save their lives. The men of the village took their revenge, however, because when he returned to Podgorica, they came up behind them and cut down about twenty Turks and seized about thirty horses. Finally, they reached an agreement with the people of Bjelopavlici for one thousand ducats and twelve slaves. Nevertheless, even after the campaign was over, the Sanjak Bey of Kaçanik and that of Pec were attacked from the rear and about seventy Turks were slain, with about eighty horses captured. They even pursued the pasha himself when he set off from Podgorica. They ambushed him in a forest at a windy and narrow stretch of the road, called Chusef Lug (Husev Lug). There they slew about forty Turks and captured about sixty packhorses, being mules and horses loaded with clothes and goods. This situation went on for two years between the rebels and the other side, and came to no result at all. As such, the highlanders paid the pasha back for the 152 slaves he had taken and made prisoner under the agreement and for the one thousand ducats, by slaying 160 Turks and stealing 220 horses, including 60 packhorses loaded with goods. With the exception of this, they remained peaceful, enjoying their possessions, wealth and homes. This is said to have taken place between the highlanders and the pasha up to 10 November 1613. At the time of the most illustrious lord Marco da Molin who was rector and proveditor in Kotor, Podgorica was visited by the Sanjak Bey of Shkodra, Ali Bey Mehmet Begovic, nephew of the great Feris Pasha, who had been such a great commander in Hungary. The aforementioned most illustrious proveditor honoured him with the usual tribute which was brought to him in Podgorica. On an earlier occasion, the aforementioned author Bolizza, a friend and acquaintance of the sanjak bey, had welcomed the sanjak bey to his home in Kotor when the latter was sick, and had taken care of him for several days. This was when the sanjak bey was acting in his capacity as deputy for his brother Ibrahim Bey, who was pasha in Canissa where he died. For this deed, Bolizza was recompensed by the most illustrious lord proveditor with equal generosity and transmitted various letters of greetings between the two dignitaries. When the sanjak bey endeavoured to take possession of his tribute, his present and the rest from the Montenegrins and they refused to contribute or give him anything, he gathered a force of 3,000 warriors, among whom were highlanders from Kuç who are now rebels, and tried by force and the sword to get what he had been verbally denied. Having forded the river Moraca and arrived at Lješkopolje in order to enter Montenegro, he put the villages of Stanjevic and Gorica to the torch. As he was advancing towards the mountains, he encountered the Montenegrins who had gathered and were guarding that difficult and imposing pass. When fighting broke out, the Montenegrins cut his forces to pieces and forced him to flee. The sanjak bey was wounded by a spear and barely managed to escape on the back of a trusty courser. The one hundred Turks were slain, among whom was his valorous steward and deputy called Saban Chiechaia (Shaban Qehaja). All the rest of his forces would have suffered the same fate, had the darkness of night not fallen. It then so happened that the normal couriers, who, as mentioned above, are men of Montenegro and who were wont to take the old route through Kuç, which was constructed at the time when correspondence was first sent from Kotor to Constantinople, passed that way with their official letters and, unaware of what had happened, were treacherously slain. Since that time, no one has wanted to put his life at stake by using that route. In view of need and public interest, a decision had to be taken quickly on a matter of such importance, and an alternative route passing though Hercegovina was found. In summer, the return journey this way was six days longer and in winter eight days longer, as will be noted at the proper spot in our description. In addition to this, the new route was more expensive. The head couriers were paid fifteen talers for each journey along the old road in summer and twenty talers in winter. For the new route, they were paid twenty talers in summer and twenty-five in winter. The prince therefore had to pay 500 ducats more annually for the new route. This is because, if we assume public letters are sent two times a month from Kotor and for each mission, two officials are despatched - though sometimes it happens that three, four or five are despatched -, this makes twenty ducats more for the outward journey and the same sum for the return journey, amounting to 500 ducats more each year, not to mention the importance and inestimable value of the time lost because the journey takes six days more in the summer and eight days more in the winter, as mentioned above. In order better to appreciate the significance of this problem and to be more exact, a description will now be given of the villages along both routes and of the posts under the flag of the republic. Note will be taken of the quality of the roads, of the place names and of the differences between them. 1. From Kotor to Podgorica, 2. Plava, 3. Pec, 4. Novoselo golos Planina, 5. Cerniza (Cernica). 1. Pliesiuzi (Pliesivci), 2. Dobranci (Dobraci), 3. Millo Cognichi (Milo Konjici), 4. Brodarevo (Brodarevo), 5. Scenize (Sjenica), 6. Novo Pasaro (Novi Pazar), 7. Dmitroviza (Mitrovica), 8. Pristina (Prishtina), 9. crossing the Cernica at Priespiro, 10. Caiva Rieca (Kajva Rjeka), 11. Cosniza (Kosnica), 12. Samocou (Samokov) where 21 mills are making iron, 13. Sarscano (Sarskano), 14 Ploudin (Plovdiv) i.e. Filipopoli, 15. Siroviza (Sirovica), 16. Harmanlia (Kharmanli), 17. Tecie (Tekke), 18. Haps (Havsa), 19. Bargas (Lüleburgaz), 20. Chivilia (Qivilia), 21. Chiembargas (Kemerburgaz), 22. Constantinople. As can be seen, Cernica is reached in winter by the old route on the fifth day, whereas it is reached by the new route on the ninth day, making a difference of four days on the outward journey and four days on the return. To the information on the number of days of travel to Constantinople must be added something about the manner in which the despatches are conveyed. The person in charge of this business, at the order of his serene highness, resides in Kotor and has in his service many couriers from the two villages of Montenegro, as has already been mentioned. When the frigates arrive from Venice with the official correspondence, it is transmitted to an official who receives a salary of twelve ducats annually. He has the duty of transmitting the correspondence to the said couriers in Montenegro. The latter, taking the old route, arrive in Podgorica, at the village of Slatizza (Slatica), presenting themselves to Count Lasso, the nephew of the priest Radonja, who receives a remuneration of eighty spudi of salt annually from the chamber in Kotor at the order of the most illustrious Senate. He accompanies the couriers to Gruda and transmits the correspondence to Count Hassan Hergelovich (Hasan Gerxheloviq), who is also in the service of the prince. He has the duty of accompanying the correspondence from Kuç to Kelmendi and transmitting it to Count Prentas (Pretash), also in the service of the prince, who accompanies it to Plava and stores it in a safe place. The same procedure is taken during the return journey. The couriers used the new route for six years with losses and with expenses amounting to a whole treasure, there being eight days of time lost. This loss is sometimes paid for dearly by princes, at the expense of their countries, because depending on whether they receive letters early or late, they can either solve important problems or not. After over three thousand ducats had been spent, it occurred to the most illustrious Lord Francesco Morosini, rector and proveditor of Kotor and an individual of great experience and great devotion to the public interest, to reopen the old route in order to save on such expenditures from the prince's purse. He nevertheless encountered many impediments and an infinite number of artificial obstacles invented by those looking more after their own interests than after those of the public. Overcoming these impediments with prudence and skill, he then summoned Mariano Bolizza, the aforementioned author, and commanded him to take up the matter with the people of Kuç and Montenegro in order to have them appreciate the significance of the issue and thus to make the route safe. Bolizza set to work and went himself to see the people of Podgorica in order to negotiate a peace with the people of Kuç and Montenegro. He held talks and, by paying the sum of one hundred talers to the heirs of the highlanders slain and by becoming blood brothers with them in accordance with local custom, he eventually succeeded in enabling the couriers once more to pass through freely and peacefully. In order to ensure that this agreement be stabilized and made permanent, he resolved to do away with the payment of twelve talers annually to Hasan Gerxheloviq of Gruda, which was superfluous because he was not on the route, and instead, to pay Count Lale Drecalou (Lale Drekalov) and Count Nico Raizcou (Niko Rajckov) of Kuç, who were to receive the twelve talers annually, so that the latter two, in paid service, would be obliged to accompany the couriers safely through Kelmendi. Danger was unavoidable in Kuç as the correspondence had to pass through this area if it were to be transported by the old route. By transmitting the correspondence to the official Prentash and, as he was being paid, being sure that he would treat the correspondence as if it were his own property, things would go well. It was also agreed to give six talers annually to Raizco Torban (Rajcko Torban), Count of Stanjevic in Lješkopolje, where the couriers could be expected to arrive a day earlier on their way from Kotor, so that he, as a powerful individual and one enjoying great respect in Lješkopolje, would accompany the correspondence and ensure its safe passage to Slatica, to be handed over to the nephews of the above-mentioned priest Radonja, who is also in paid service, for further transport to Kuç. To ensure the best effects of the agreement, Bolizza had a son of Count Lale Drekalov, and Count Niko Raickov himself, the principal and most powerful leaders of Kuç and of all the highlanders, brought to Kotor. As they were known to the most illustrious lord proveditor, he could himself then, if he deemed the matter to be of sufficient importance, sign an agreement with them in writing. Once the matter was approved of by the aforementioned lord proveditor, the written agreement was officially sanctioned by the aforementioned persons and duly signed by the most illustrious lord as well as by the said Bolizza. Two head couriers were then found, who accompanied the nobles of Kuç back to their homes and, together, set off for Constantinople by the aforementioned old route. They got through safely and repeated their journey back and forth four times, for as long as the aforementioned most illustrious lord Moresini was in power. Once he departed, however, the old route was interrupted for no apparent reason, whereas the new route continued to function as it has been doing up to the present day with the same expenses of 500 ducats more and with the loss of eight days. Bolizza was indeed requested by many kind letters from those partaking in the agreement and from all the leaders of the highlanders, his friends, to make use of the old route, which they insisted they would guard and keep open. If requested by Bolizza, they agreed to present themselves wherever his most serene highness wished and to do whatever would be necessary to ensure adherence to the agreement. What remains to be described is the land route from the Buna river to Durrës, Lezha and Kruja, although this route is beyond the scope of this report and outside the Duchy of Shkodra. The city of Lezha is the bishop's residence. The fortress and the open town contain 500 houses. It can furnish some 700 men in arms. Here, also, are the docks of the merchants, commanded by Nasor of Castelnovo (Hercegnovi). Kruja, which is a royal city, was the seat of the invincible captain George Castrioti, known as Scanderbeg. It is a grand and unconquerable fortress constructed on a hill and well-guarded. Weapons are produced inside it. Pres (Preza) is a citadel with a castle on a hill surrounded by an open town, a total of 150 houses. The site can be guarded and maintained easily, 350 men in arms. Durrës is a very ancient city in Albania, situated on the sea coast, and is constantly visited by barbarian galleys which use it as a safe haven to recover in. The Aga had come into conflict with the leading Turk and lord of Albania, called Elez Bey, because he repudiated his wife, the daughter of the said lord, whom he had found in bed with her servant. For this, he was persecuted and given up unto the hands of some subjects of the blithe city of Perast. They seized all his valuables and took them away with two galleys. He was persecuted by a sanjak bey related to the aforementioned Elez Bey and took refuge in Budva, continued on to Venice and Kotor and from there departed for Constantinople. He did this in order to recuperate his position and residence as Aga with the assistance of the most excellent Lord Bailie who enjoyed his confidence. The aforementioned Buna is five, six or seven feet deep at its mouth and, upriver, as was said above, it can be navigated up to Sergio (Shirq) by all large ships and galleys. San Juane di Medua (Shëngjin i Medues), three to four feet of water. The Drin, by which one can sail to Lezha, is the same. The Matthia (Mat), four feet of water. The Ismo (Ishëm), five feet. Santa Anastasia di Redoni, harbour. San Piero (Shën Pjetri) outside of Redoni, harbour. The Arzenta (Erzen), three feet of water. Cape Palli (Pali) from the inside to Durrës, harbour. Bastovo (Bashtova) has three feet of water. Pollona (Apollonia) has four feet of water. The Vovissa (Vjosa) has five feet of water. A description of the twenty-five villages of Zuppa (Zupa) which belonged to the nobles of Kotor. These were bestowed upon that magnificent community by the emperor of Serbia, apparently in exchange for privileges, and held for a period of 120 years after its felicitous submission to the Venetian lion. Then they rebelled against the Turks. They have a territory sixteen miles long and six miles wide with two rivers containing fifty water mills. These together produced for the community 7,000 stara of wheat flour a year, in addition to covering various financial obligations and presents. These villages are subject to the Sanjak of Shkodra, but since they also include the saltworks of the sultan, situated on the plain of Kotor, they are commanded by Nasor and the Emin of Castelnovo (Hercegnovi). On order of the sultan, two thousand persons come down in May of each year from Montenegro to the plains of Kotor to tend the saltworks, i.e. to look after and keep up the site, to excavate and clear the channels of the mud and earth which fill them during the winter floods, and to take care of the square earthen bed upon which the salt is won and produced. = total of 375 men in arms commanded by Vuco Domcou (Vuko Domkov). = total of 418 men in arms commanded by Andrea Nicou (Andrea Nikov). = total of 563 men in arms commanded by Vuco Medou (Vuko Medov). The 25 villages thus have 742 houses with a total of 1,648 men in arms. Among these, there are some three hundred good arquebus men. The others use swords, shields and spears. Most of the arquebus men were trained on the armed vessels of the Uskoks, from which they were either freed or from which they fled, taking their arquebuses home with them. As mentioned above, they all live according to Serbian rite. The Duchy of Shkodra borders on one side on the Sanjak of Zadrima in Albania, above that on the Sanjak of Pec, on another side on the Sanjak of Hercegovina and on the fourth side on the towns and lands of the most serene dominion of Venice, i.e. Paštrovici with Budva and Kotor. Every district has its own kadi, who is the Turkish judge, who pronounces judgment and administrates law for the population. The Kadi of Montenegro resides in Lješkopolje and deals mainly with regulating the sultan's saltworks on the plain of Kotor. The Kadi of Zetta is in Podgorica. The Kadi of Shkodra resides with the sanjak bey of that town. The Kadi of Bar resides in the town of that name. This sanjak extends for a three days' journey from Shëngjin in Albania up to Bjelopavlici and for a journey of an equal time from Njegoš, which is at the border of Kotor, to Pec. The first main part, which is Montenegro, has 90 villages with a total of 3,524 houses and 8,027 men in arms, of whom some 800 are arquebus men. The others use swords, shields and spears and they are all of Greek rite. The second part is Bar with its territory which comprises 17 villages with 885 houses, excluding the town and 2,762 men in arms including the town, of whom some 400 are arquebus men. The others use bows, arrows, swords, shields and spears. The third main part is Ulcinj which has no surrounding land and which produces some 800 men in arms, of whom 400 are arquebus men. They are competent and most of them are seamen and pirates. The fourth main part is Shkodra which comprises 105 villages with a total of 3,544 houses, excluding the town, and 9,240 men in arms, of whom about 1,200 are arquebus men. The others use bows, arrows, swords, shields and spears. All the villages are Albanian of Roman rite. The fifth main part is Podgorica, the town, i.e. both the fortress and surrounding open town, including 17 villages with a total of 1,697 houses, including the open town. It has 4,376 men in arms including the fortress and open town, with about 300 arquebus men. The others use swords, shields and spears. The highland rebels have 11 villages, of which six adhere to Roman rite and five to Serbian rite. They make up 2,347 houses with 5,380 men in arms. The sixth main part is Plava which comprises 23 villages, including 1,360 houses and 3,016 men in arms, of whom some 100 are arquebus men. The others use swords, shields and spears. Città Nova (New Town) has two hundred paid arquebus men and 500 cavalrymen. In Zuppa (Zupa) there are 25 villages, 742 houses and some 1,648 men in arms, of whom about 250 are arquebus men. The Duchy of Hercegovina and Bosnia borders on Kotor and its jurisdiction. Accordingly, when one enters the mouth of the Bay of Kotor, one sees Castelnovo (Hercegnovi), an exceedingly weak fortress, although the other one above it could be maintained for a certain time. In this fortress live only Turks, although the open town is inhabited by Christians of Roman rite. They make up some 400 warlike men in arms. It has several villages under its jurisdiction. Advancing along the inner coastline of the bay, one reaches the village of Draceviza, commanded by Count Nicollo, the son of count Millutin. It comprises 300 houses and 700 men in arms. Onogisti (Onogosti) and Nichsich (Nikšic), commanded by the son of the voyvode Gardan, border on the rebels of the Duchy of Shkodra. From Nikšic to Bjelopavlici are eighteen miles. Gliubomir (Ljubomir), held by a Turkish beyzade, captain of Castelnovo (Hercegnovi) and Nerenta (Narenta), because he has his estate here. Rudine and Bagnani, bordering on Onogosti, commanded by Raduoie Giuretin (Radvoje Djuretin) and Nixa Lalin. Risano (Risan), on the shore near Perast. It is a small but strong castle with an open town below. As such, the whole Duchy or Sanjak of Shkodra comprises eight cities, these being 1. Bar, 2. Ulcinj, 3. Shkodra, 4. Drisht, 5. Zabljak, 6. Podgorica, 7. Medun, 8. Città Nova. These make up a total of 288 villages. These make up a total of 14,099 houses. of whom 3,650 are arquebus men at the most. (1) Turkish katran 'tar, pitch'. (3) Turkish seyman, segban 'keeper of the Sultan's hounds', later incorporated into the janisssaries. (4) Turkish arpalik 'field of barley, kind of fief, stipend'.